For any individual of any age or skill level, from beginner to the PGA Tour Pro, who desire unlocking the timeless secret and feel of centrifugal force & swinging in a circle for increased accuracy, distance, self-confidence, ability to self-correct, lower scores, while having “fun” learning it! As a master of teaching the feel of the circular swing and proper application of centrifugal force for optimal performance, Wally's ways are in sharp contrast to the paralysis-by-analysis of today's "mechanical golf" instruction from modern day instructors, golf magazine articles and Internet tips. Typical instruction today instead has golfers consciously performing complex mechanical behaviors in sequence, requiring superb physical conditioning, hitting thousands of practice balls, leading to a lifetime dependence on the instructor. Wally Armstrong Golf applies the secrets from yesteryear's legends where all the great players simply swing in a circle by feel, resulting in maximum centrifugal force, power and accuracy. We help any golfer master achieve this same feel of the circular swing and proper application of centrifugal force, with similar results, making the game of golf fun and enjoyable to learn and play. Wally's approach to teaching learned from the legends of the game, uses the simple image and feel of the "circle" to communicate the concept of centrifugal force – the key to achieving power and accuracy. 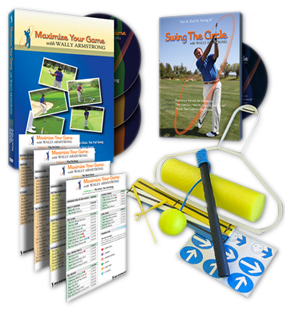 As an expert, articulate educator who makes learning golf simple, fun and easy to understand for players of all ages and skill levels, Wally's genius for innovation in educational methodology is clearly seen in his simple but powerful homemade training aids/drills that Wally uses to first create a memorable image of the circle, followed by the feel and power of the circular swing through the proper application of centrifugal force resulting in increased accuracy, distance, lower scores, self-confidence and ability to self-correct. Wally is the master of teaching the feel of the swing. The golf swing is an arc, a circle, where accuracy and power is achieved through centrifugal force. Yet, most teachers forget this as they focus on mechanics, parts and pieces, without a holistic picture and feel of the circular swing. Wally's PGA Tour playing experience with the stars of the game on the PGA Tour — Nicklaus, Palmer, Player, Trevino, Miller, etc., confirmed the fact that optimal power and accuracy is achieved as one swings in a circle, while maximizing centrifugal force. Wally's educational expertise equips him to communicate this truth in a simple and easy to understand way that produces immediate and long term results with beginners, juniors & adults making the learning process fun. Gary Player confirms this by saying, 'Wally Armstrong is the true master of teaching the feel of the swing."